Over the last couple years, my discipleship group has become accustomed to an end of semester party. When we were studying the 39 Articles, we dubbed it the 40th Article. This semester, we studied spiritual disciplines, so we called it the Discipline of Fellowship. 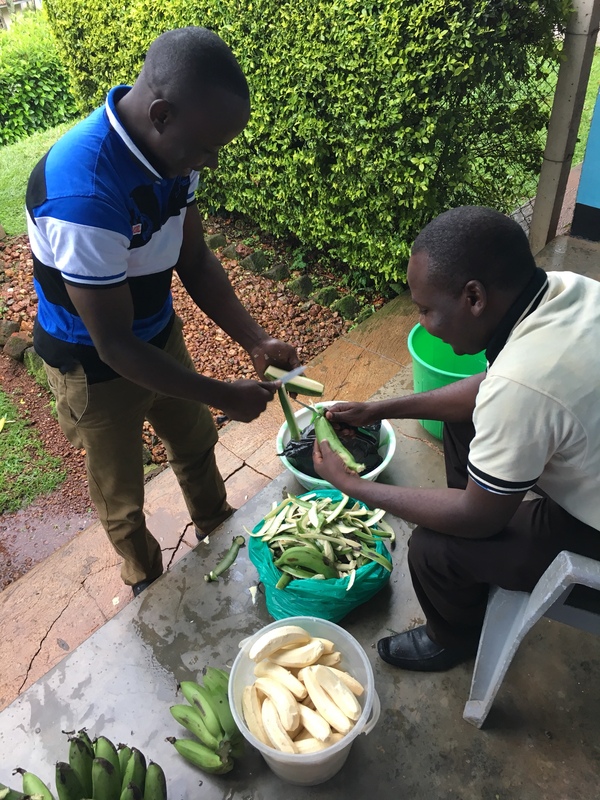 Brian and Saul wanted to make matooke, the staple food for the Baganda, and fish. All I had to do was provide the kitchen and tea after. Sounds like a win! 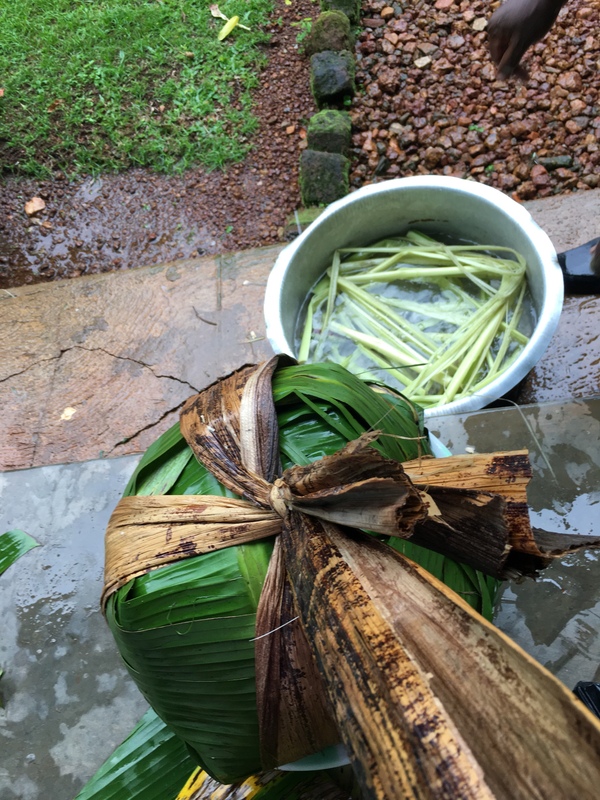 I had no idea how matooke was made, and was very interested to learn. 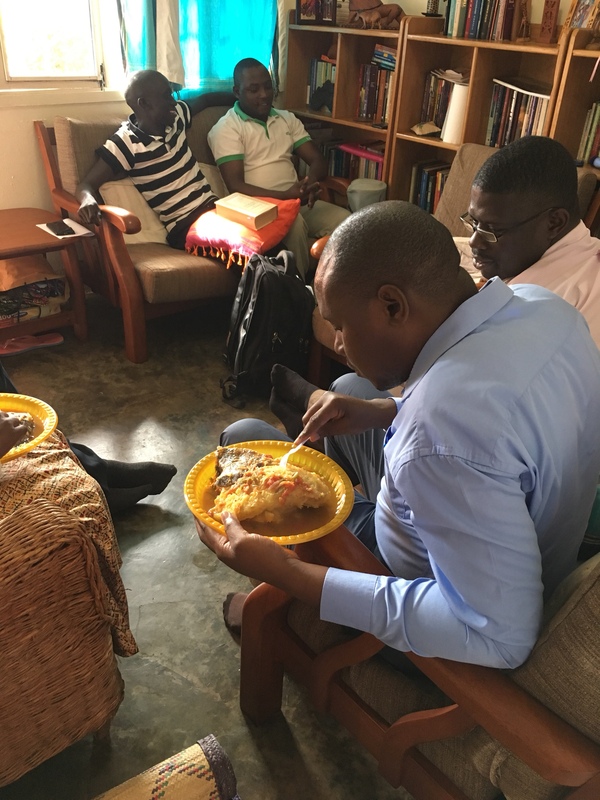 Brian brought over the matooke, fish, and spices (vegetables to make the sauce: tomatoes, onions, and green pepper). 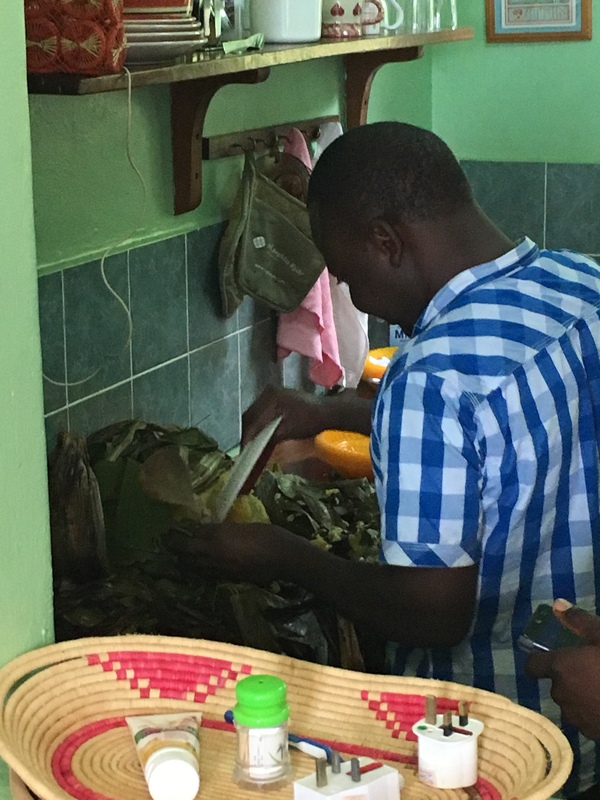 Then he started peeling the matooke. My knives have never had such a workout. Saul came and joined in the work, and soon enough, they were done. 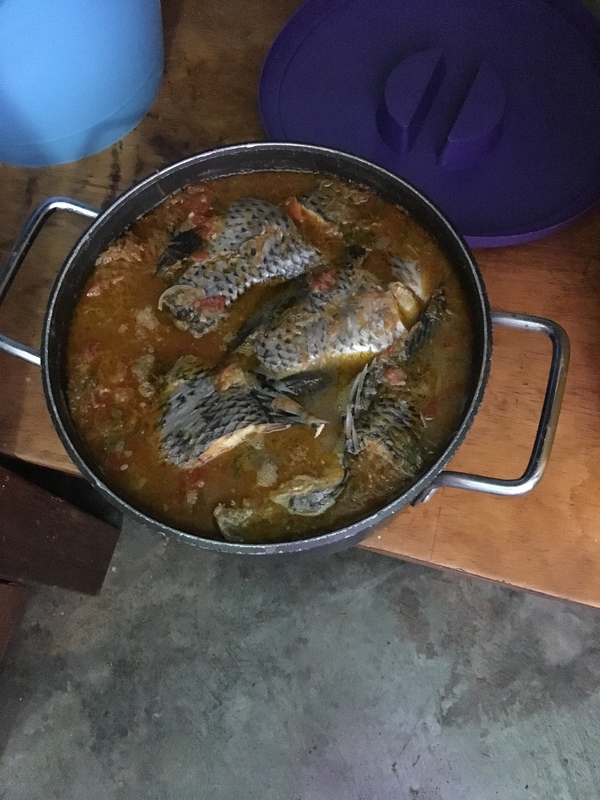 Brian moved to the kitchen and began to work on the fish and sauce, while Saul continued with the matooke. 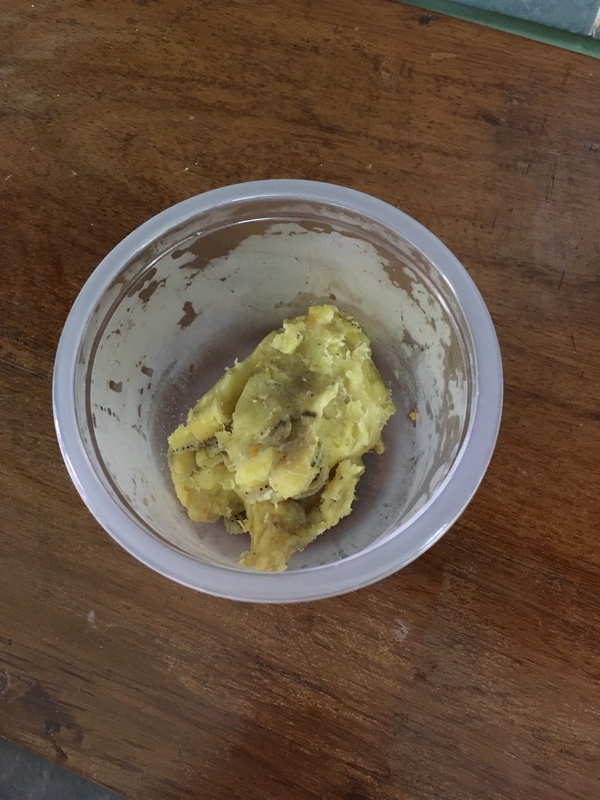 He had retrieved some banana leaves and banana bark, and he placed the latter in a bowl crosswise, then a few banana leaves. 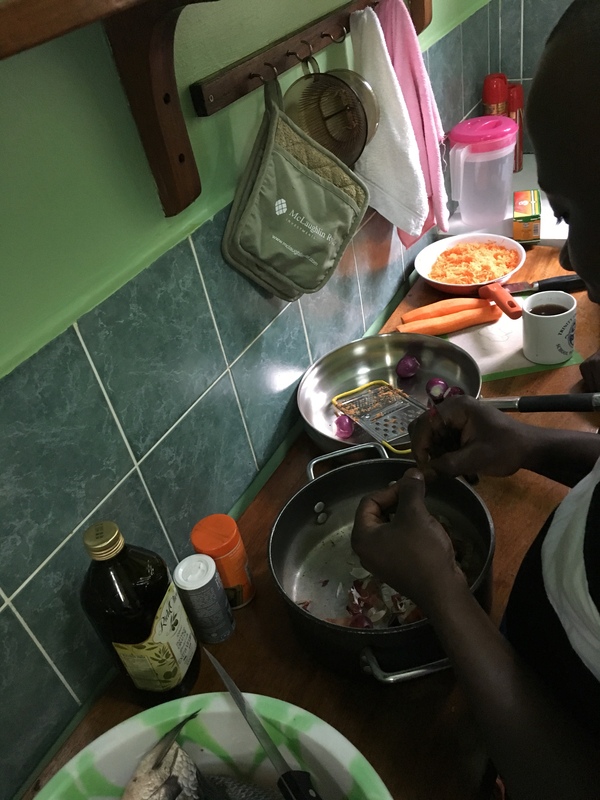 Then he added the matooke. I was convinced it would never fit, but he proved me wrong. He then added more leaves, then tied it all tightly with the bark. 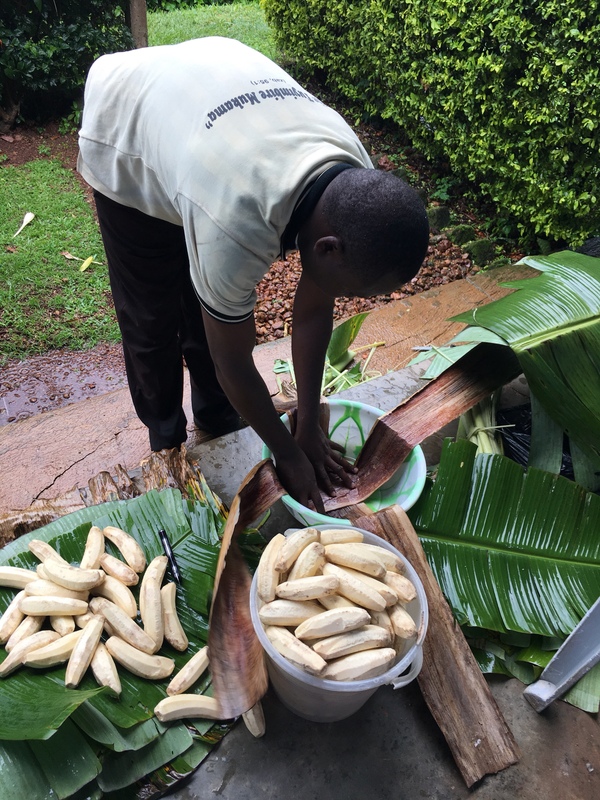 Saul then cut the spines of the banana leaves and some of the trunk so that the matooke wouldn’t touch the bottom of the pan. He added water, and voila! 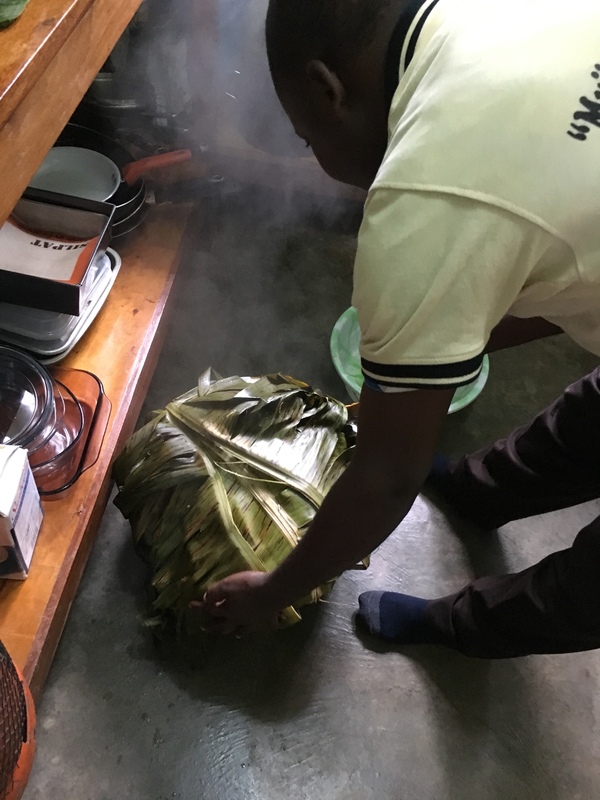 A matooke steam bath was born. 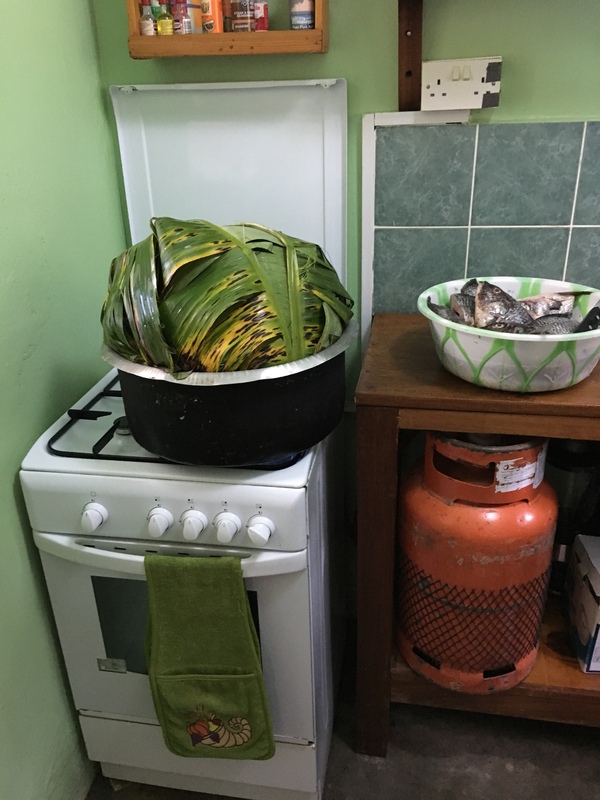 Now the matooke (in the pan we borrowed from the guest house because I don’t have a pan large enough) went in the stove to steam away. It eventually received another bowl as topper to trap the steam. 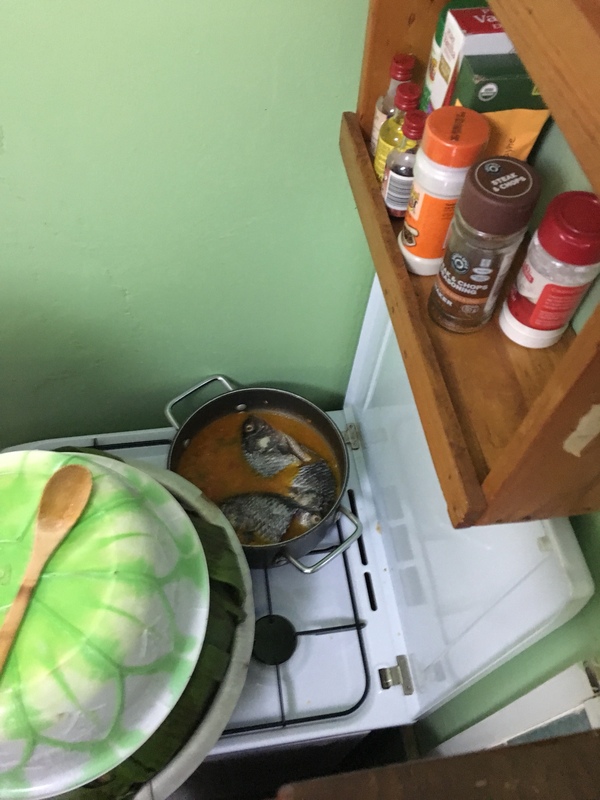 Brian continued to work on the fish and sauce, kicking me out of my own kitchen when I tried to help. Twice. 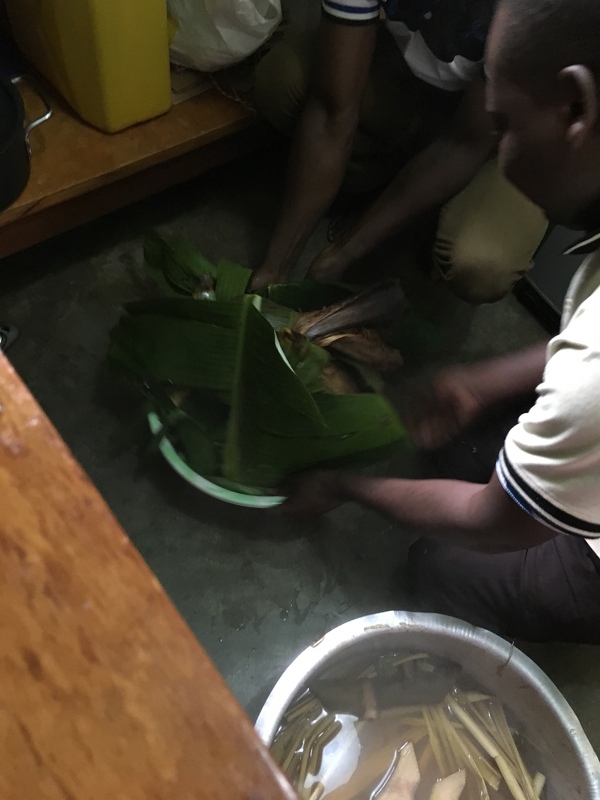 When the matooke had steamed enough (they kept pressing the leaves to see how soft it was), they removed it from the sauce pan, then took other leaves and mashed (though I think the proper term is “pressed”) it, working quickly because it was hot. Then it got re-wrapped for more steaming. 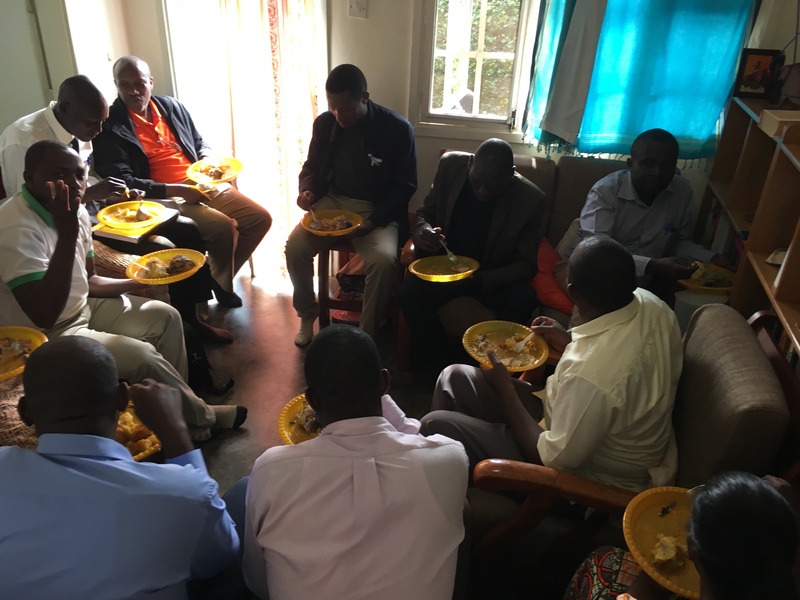 When it was finished, Saul then used a plate to scoop and serve, and we all enjoyed tremendously. 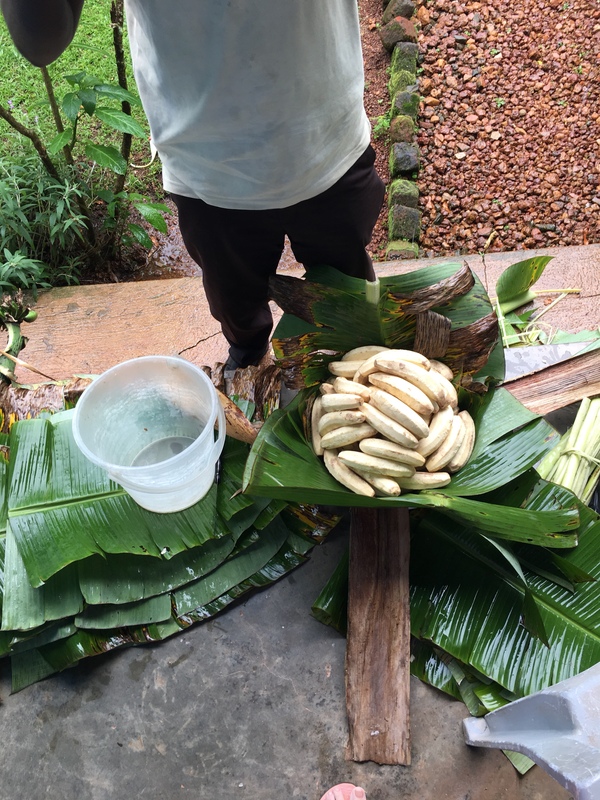 And out of that huge bunch of matooke (which fed 18 people) only this remained, which I gave to Saul.